CULLMAN – Do you or a loved one currently use a CPAP? If you are new to CPAP or have been using it for years, you’re invited to join us at Cullman Regional for a Cullman A.W.A.K.E. (Alert, Well, And Keeping Energetic) support group meeting. We will have sleep professionals present to answer questions and provide information, as well as other people who have used CPAP and have had the same experiences. We hope to provide the support and encouragement you need to make your CPAP therapy as successful as possible and remind you that you are not alone. Everyone is welcome to attend, but space is limited. Refreshments will be provided, and attendance is free. The Cullman A.W.A.K.E. Support Group will be held on Thursday, Sept. 20 from 5:30-6:45 p.m. in the Colonel Cullmann Room, located in Professional Office Building 2 on the Cullman Regional Campus (1912 Alabama Highway 157, Cullman, AL 35058). 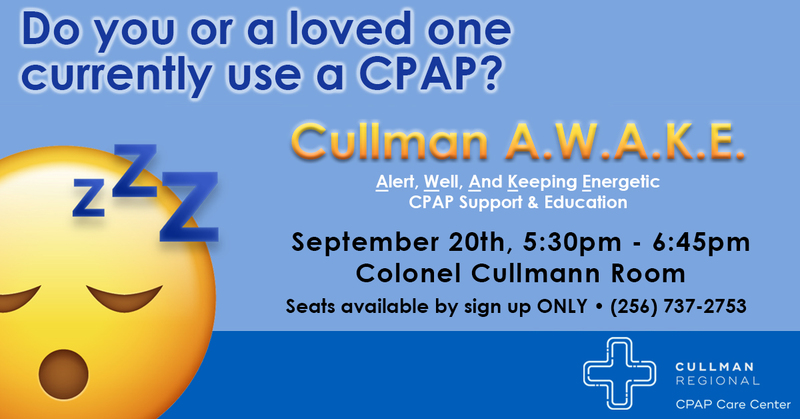 For more information, or to reserve your seat, call the Cullman Regional CPAP Care Center at 256-737-2753.